In Newark's historic ‘gone but not forgotten’ category are two diverse downtown places that no longer line Broad Street: The Gothic-style St. Paul's Methodist Church at the Marshall Street intersection and the traffic tower that once stood at the Market Street corner. The church at Marshall Street (near Court Street), stood from 1854 until 1936. During its lifetime, it served as a downtown society church for wealthy Newark Methodists such as Gov. Franklin Murphy, owner of the famous Murphy Varnish Works. Later it hosted the Downtown Boys' Club. The stunning English-styled structure was particularly noteworthy because of its massive stained-glass windows. The great window on the church's front wall was 21-by-30 feet and covered most of the building's Broad Street facade. It was designed by Walter Crane and told the story of St. Paul preaching in the streets of Athens. Five smaller biblically inspired windows ran along both sides of the church's nave. Unfortunately, neither the building nor the stained glass survived the Great Depression in spite of considerable efforts to save both. 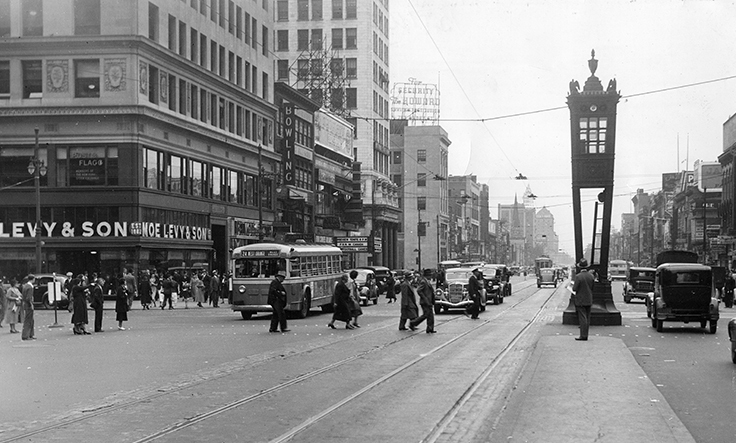 The traffic tower at Broad and Market streets was built in 1925 at a cost of $25,000 by the City of Newark and the Broad Street Association to control traffic at the 'Four Corners.' On July 25, the old Newark Star reported that a ''master light in the tower will flash the signal to officers up and down Broad Street and signal when to stop and let traffic go, so that it will move in unison.'' The 24-foot high tower was constructed of steel and covered with bronze similar to towers along New York City's Park Avenue. However, soon after the tower's construction, the old semaphore system was replaced with a new synchronized traffic system, and by 1938 bids were advertised for the structure's removal. Today the tower is located in Cresthaven Memorial Park (Cemetery) off Route 3 in Clifton, Passaic County.